‘Rethinking Poverty – What Makes a Good Society?’ – by Webb Memorial Trust Director Barry Knight – was launched in September 2017. This regional discussion event will explore the book’s key themes, implications for the North East and next steps for social action. Speakers include Barry Knight (Webb Memorial Trust), Professor John Veit-Wilson (Newcastle University) and Sara Bryson (Tyne and Wear Citizens). In our society, a wealthy minority flourish while around one-fifth experience chronic poverty and many people on middle incomes fear for the future. Social policy has failed to find answers to these problems and there is demand for a new narrative. Rethinking Poverty argues that we need to start with the society we want, rather than framing poverty as a problem to be solved. It calls for a bold, forward-looking social policy that addresses continuing austerity, under-resourced organisations and a lack of social solidarity. Based on a research programme carried out by the Webb Memorial Trust involving community activists, academics, think tanks, business, young people, and surveys of more than 12,000 people, a key theme is power which shows that the way forward is to increase people’s sense of agency in building the society that they want. This event is free but places are limited and registration is essential. For enquiries and to let us know about any dietary requirements please contact the NECPC Coordinator on deborah.harrison@durham.ac.uk. The North East Child Poverty Commission (NECPC) is a partnership of over 30 public, private and third sector organisations in the region. 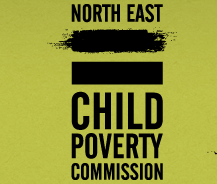 The NECPC’s aim is to raise awareness of child poverty in the North East and work together to tackle the problem. www.nechildpoverty.org.uk. 4 December 2017 – Rethinking Poverty with Andy Burnham: Can Manchester lead the way? 26 October 2016 – Whose Responsibility is Poverty? 19 October 2016 – What is the future of social housing? 3 May 2016 – What is the role of business in reducing UK poverty?